In an interview aired on Sunday with journalist Charlie Rose of CBS for the program 60 Minutes, President Assad associated the expansion of the Islamic State of Iraq and Syria with the U.S airstrikes in the region as he spoke about leaving power and the gas attacks. Assad said “sometimes you could have local benefit” from the U.S led airstrikes but signaled that “in general if you want to talk in terms of ISIS, actually ISIS has expanded since the beginning of the strikes.” He added that the situation has worsened as the ranks of the extremist group have also been swelling in Iraq and Libya as groups continue to pledge their allegiance. ISIS declared some parts of Syrian and Iraqi territories under its control as an Islamic State and Assad said there are estimates of 1000 recruits joining the group from Syria on a monthly basis. Arab and European countries are concerned about their nationals fighting for the Islamic State because of fears that they might export the violence to their home countries. U.S and its allies have refused to cooperate with Assad because they want him to leave and have vowed not to negotiate with him. President Assad said he will leave power: “When I don’t have the public support” and “don’t represent the Syrian interests, and values.” Quizzed about how he determines the support of Syrians, Assad replied “I don’t determine. I sense. I feel. 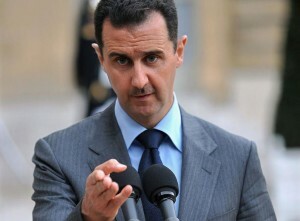 I’m in contact with them.” Assad was reelected last year for another seven year term in office. Written by: Peter Mulvany on March 30, 2015. Posted by Peter Mulvany on Mar 30 2015. Filed under Headlines, World News. You can follow any responses to this entry through the RSS 2.0. Both comments and pings are currently closed.